I got another late start today, July 7, 2017. Left the garage at 7:38 a.m. (exact same time I left on the July 1 PD shoot) and arrived at my parking spot for the first leg of the prairie dog shoot at 8:31 a.m. This time I had to avoid laying prone because that caused me lots of pain last July 1. I left the pickup around 8:57 a.m. and I had my Caldwell DeadShot FieldPod and a little stool with for today. It took me quite a bit of time to get the FieldPod adjusted. I still have some major tweaks I want to do to improve the stability of this rest. I had to take my bipod off and carried that back to the pickup. I had also taken elbow pads along and dropped them off at the pickup too. I didn’t start shooting until about 9:20. I managed to hit on 8 of 8 shots at distances from 80 to 130 yards. Here’s a photo of the setup I used today. The rifle is a .17 Remington built on a 700 BDL action and the stock is an H-S Precision aluminum pillar bedded stock. I have a Jewell trigger in this rifle and it is adjusted to 1 pound of pull. The scope is a Leupold VXIII 8.5-25x50mm with the Varmint Hunter reticle. Yes, it might be a bit of overkill for PD shooting, but I really like it. The chamber on this rifle has a .1945" neck and I turn the necks of the Remington casings so the neck walls are approximately .0099" thick. I’m using 30 gr. T-000 Nagel bullets coated with hBN and my load is 24.1 gr. of N-540 and I use Tula small rifle magnum primers. 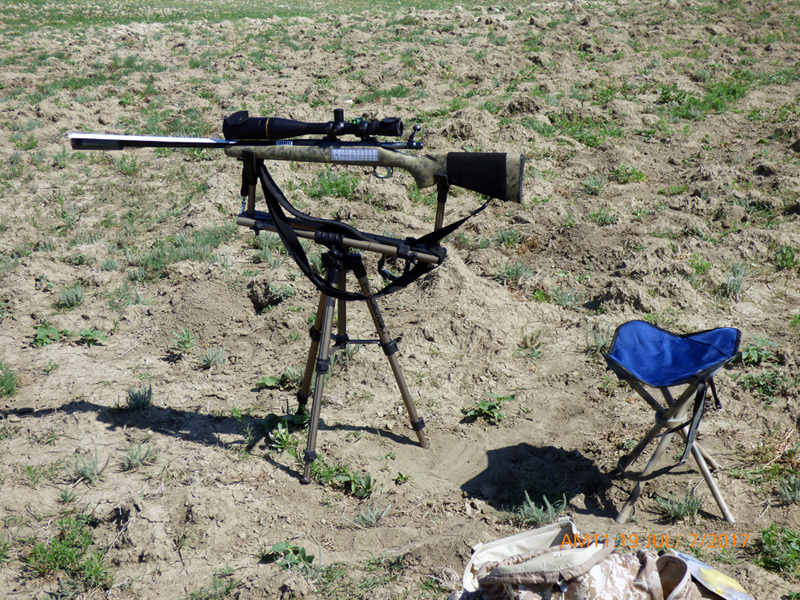 Muzzle velocity for this load is approximately 3,720 fps and it turns prairie dogs inside out. The FieldPod IS NOT as steady as lying prone and using my Harris swivel bipod so I decided I wouldn’t take any shots much longer than 175 yards—there was just too much crosshair movement with the FieldPod. I took some time and replenished the shells in my shell holder on the stock and noticed seven horses coming towards me to check out who or what was making all the loud booms. One of the horses got too close for comfort so I shooshed it away. By 9:48 I had taken seven more shots and I managed to nail one double and 6 singles so the total body count was up to 16 dead PDs with 15 shots. Around 10:00 a.m. I picked up my gear and started walking south over the rise and the doggone horses followed me. I couldn’t shoot with them around so I took a break and ate a cookie and drank some ice water. The horses headed off way to the south and I was able to start shooting again around 10:26. A little after 11:00 I decided to head to the pickup and have some lunch. By that time I had taken 30 shots, hit on 29 singles and nailed one double. Shot distances were from 45 yards to 156 yards according to my Leica LRF 1200 range finder. I drove my pickup over the hill to the south and parked to have lunch. After lunch I lay down in the back of the pickup box and took a 50 minute nap. It was only 80º!!! When I woke up I had prairie dogs barking so I got my rifle ready and shot 3 more PDs using my tailgate as a shooting bench. I started walking to the SW at 1:40. The wind had picked up and was blowing 10 to 15 mph out of the ENE and the temperature was up to 82º. Here’s one of the PDs that suffered a fatal wound. This one has fairly dark fur. 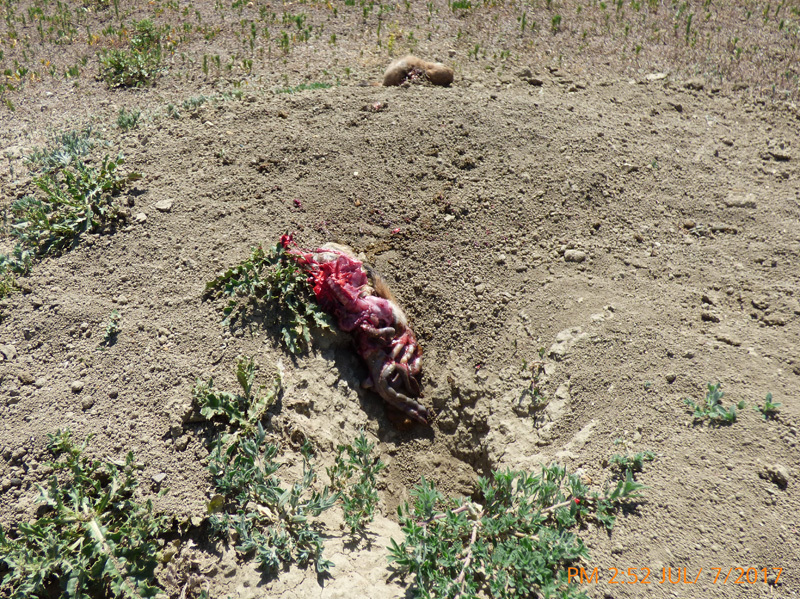 The next photo shows two prairie dogs that fell victim to one bullet in my morning shoot. The front PD was totally destroyed and the one that was standing behind it, suffered fatal injuries too. I had 18 rounds left to shoot and decided that when they were gone that I would head back home. By 2:21 p.m. the temperature was up to 84º and I had 10 more shells left to fire. I finished firing the 10 shells and hit on all of them with one shot maybe bagging a double, but I couldn’t be sure. I took a few photos of some dead critters and was back at the pickup at 3:37. The temperature had gone up to 88º. 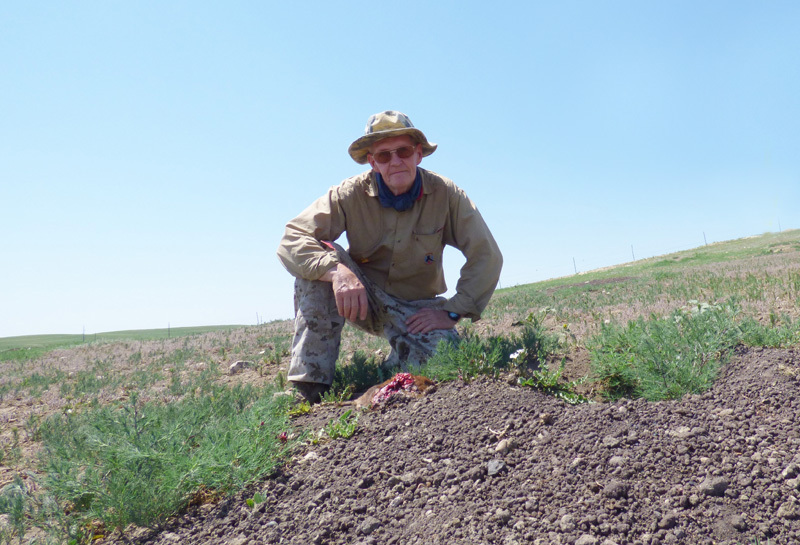 When I got back to the pickup, there was one prairie dog east of me that was begging for a bullet so I opened up a new box of shells and obliged it. I had shot 53 shots, hit on one double and 52 singles for a total of 54 dead PDs. It may be hard to believe, but I didn’t miss any shots today. Here’s the “Hero Photo” for today. This prairie dog had very dark brown fur and this area of this dog town has produced many, many prairie dogs with dark fur. Wonderful as always. Man your a die hard PD shooter and it sounds like where you shoot is fairly close, lucky you. I enjoy getting out and shooting the little buggers but they seam to get push to the back of the line in the time allocation. Nice write up Silver fox. Been looking at those tri-pod shooting stands. It would be for under 200 yard deer hunting. I think it would be ok for that. 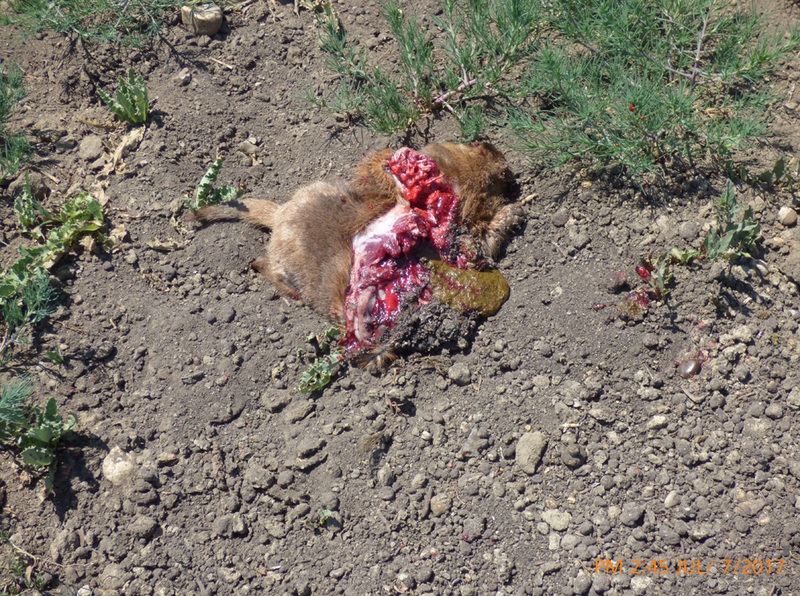 bullseye-69--You better get the June 2017 prairie dog hunt story posted real quick. I hope to see lots of fabulous photos too!! !